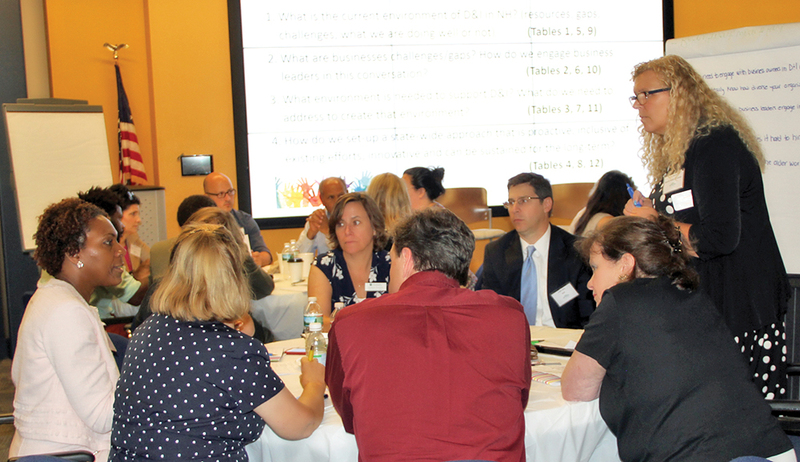 Attendees participate in breakout sessions at the Governor’s Advisory Council on Diversity and Inclusion event at Eversource. Courtesy of the NH Division of Economic Development. Issues of diversity&comma; equity&comma; race and gender have continued to dominate the headlines in the past year&comma; from the Black Lives Matters movement and the NFL to #MeToo. Amid these national debates&comma; there are several efforts under way in the state to address issues of diversity and equity that have attracted a swath of leaders. That includes the formation of the Governor’s Advisory Council on Diversity and Inclusion in December 2017. The group of roughly 19 members is made up of state government&comma; including the departments of education&comma; safety&comma; labor&comma; and health and human services; the attorney general’s office; and leaders from universities&comma; the American Civil Liberties Union&comma; local law enforcement&comma; municipalities&comma; and the public. The goal of the council is to review state laws and policies&comma; and recommend ways to make them&comma; and the state&comma; more inclusive. Additionally&comma; the advisory council is tasked with recommending initiatives to combat discrimination. The council is also holding listening sessions across the state to get a sense of what people of color and other underrepresented groups are experiencing in NH and ideas for possible solutions. Six months in&comma; the council released a preliminary report raising concerns that the listening sessions may not be providing a full picture of the challenges and discrimination people of diverse backgrounds face in the state&comma; as some may not feel comfortable discussing them in a public venue. Likewise&comma; the council wrote that it may also be missing out on hearing about successful diversity practices in communities. To remedy this&comma; the council is doing more outreach prior to the listening sessions to entice more people to attend. It has also developed a mechanism by which people can confidentially submit their experiences to the council. Others at listening sessions told the council that there are barriers to fully participating in society and accessing institutions for young and underrepresented people. They include the high cost of higher education as well as the lack of reliable public transportation&comma; affordable housing and services to assist with language barriers. “...which discourages younger and underrepresented individuals from coming to&comma; remaining in&comma; and thriving in New Hampshire&comma;” the report states. • The lack of sufficient protection for gender-nonconforming individuals under state law. • The fear of immigrants and refugees that they will be detained or deported. • The inability of individuals with disabilities to secure gainful employment&comma; despite vocational training. The council outlined recommendations and next steps&comma; including the state inserting language in all identity-referencing statutes&comma; ordinances&comma; regulations and policies allowing protections for transgender and gender-nonconforming people. Further&comma; they urged state and local governments to find ways to celebrate or acknowledge the identities&comma; cultures&comma; holidays and events of the people who live there. One suggestion is to celebrate Juneteenth&comma; which is the day commemorating the end of slavery in the United States. The report authors point out that this day is important particularly to African-Americans and is observed in 45 states&comma; but not NH. However&comma; this year&comma; Gov. Chris Sununu issued a declaration recognizing Juneteenth. The council continues to hold more listening sessions&comma; including a recent one specifically for the deaf and blind community&comma; says Rogers Johnson&comma; president of the Seacoast NAACP and chair of the Governor’s Advisory Council on Diversity and Inclusion. The council is also seeking local partners to organize future listening sessions and plans to support community-based initiatives that promote diversity and inclusion. The Council will also coordinate training and learning sessions to deepen their own understanding of diversity and inclusion. 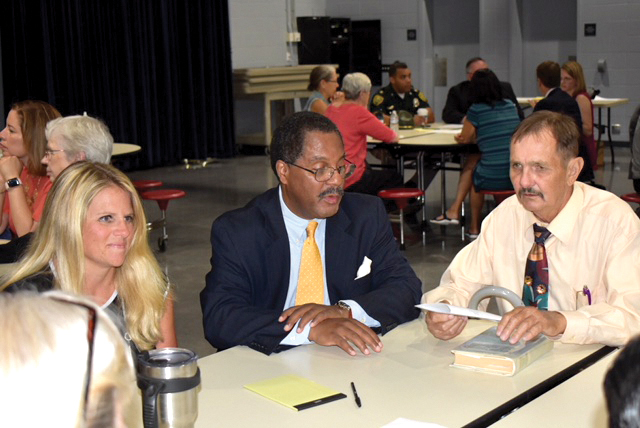 Governor’s Advisory Council on Diversity and Inclusion Chair Rogers Johnson&comma; center&comma; at a listening session held in Laconia in September. Photo by Thomas Caldwell /Laconia Daily Sun. Johnson says that though the council’s final report isn’t due until December 2019&comma; the group will continue to make preliminary recommendations as necessary ahead of that deadline. “The [state] budget is the blueprint to which the priorities of the state are laid out&comma;” and the legislature will start the budget process in January 2019 and finalize it in July 2019&comma; Johnson says. “So in order to have some of these things talked about and implemented&comma; we&comma; by necessity&comma; have to address some of these things now.” He says if the council were to wait until December 2019 to release all its findings and recommendations&comma; the state could not begin addressing them until 2021. The Governor’s Council is not the only group making strides when it comes to addressing diversity in NH. The Endowment for Health&comma; a statewide&comma; private&comma; nonprofit foundation with a mission of improving the health of NH’s people&comma; especially those who are vulnerable and underserved&comma; has continued with several initiatives this year aimed at engaging leaders in discussions about equity. Yvonne Goldsberry&comma; president of the Endowment&comma; based in Concord&comma; says it has two tracks to address race equity: leadership training and raising public awareness&comma; ideally toward policy changes. The Endowment offers the Leadership Learning Exchange for Equity program&comma; also known as L2E2&comma; which brings white leaders together to engage in personal reflection and to learn strategies for addressing racial bias and discrimination in workplaces and communities. It invites cohorts of white leaders from across the state to participate in an overnight retreat and three follow-up meetings that involve frank discussions about race and white privilege as well as reading articles and watching programs on the subject in between meetings. So far seven cohorts&comma; involving more than 120 leaders&comma; have participated in the program since it launched in 2015. The Endowment also supports the Equity Leaders Fellowship and Emerging Leaders in Communities of Color. These yearlong programs focus on people of color who are midcareer and want to serve on boards&comma; committees or commissions and helps participants develop the leadership skills to be “at different kinds of tables than they would have been at&comma;” Goldsberry says. Currently&comma; the Endowment is working on pulling together alumni from L2E2 for ongoing learning opportunities&comma; Goldsberry says&comma; as well as alumni from the other two programs to create a community where participants can exchange notes on experiences and ideas. Last fall&comma; the group hosted a symposium on race&comma; titled “Race & Equity in New Hampshire: Building Foundations for the Future&comma;” which drew more than 260 attendees&comma; the limit of the function room. (The Endowment had a waiting list of people wanting to participate.) Attendees were organized into work groups to explore such topics as civic engagement&comma; economic development&comma; education&comma; government&comma; health and law enforcement/criminal justice. According to the report issued after the symposium&comma; each work group identified challenges in these areas and then possible action steps. 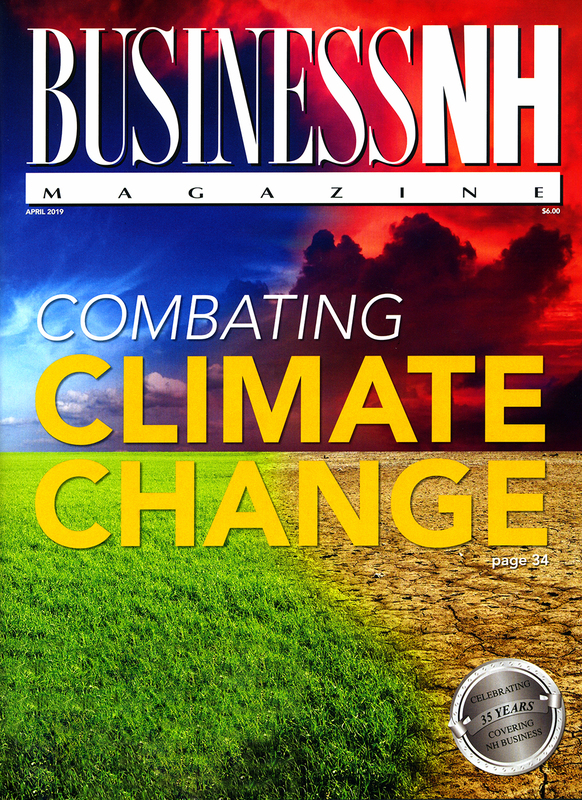 For example&comma; the economic development work group asserts that challenges include a lack of data about diversity in companies and funding organizations&comma; and that education is needed to increase understanding among business leaders about how companies can benefit from recruiting and retaining a diverse workforce. The work group made several suggestions for the next steps&comma; including creating opportunities for organizations and individuals to collaborate on economic development with an eye toward racial equity; creating access to capital for marginalized individuals and communities; and developing strategies to highlight the economic benefits of inclusion&comma; diversity and equity. Goldsberry says during the next seven months&comma; the Endowment will bring together smaller groups of people who attended the symposium to hone action plans. She says this work will culminate in another symposium in spring 2019. Another organization focused on these issues is the Diversity Workforce Coalition (DWC)&comma; a volunteer-run nonprofit that promotes diversity in the workplace through education&comma; networking and training. Among those efforts is a Women in Technology event in October that highlights the need to attract a more diverse workforce to STEM fields and to encourage more girls and women to enter those fields&comma; says Tina Sharby&comma; president of the Coalition. In April&comma; the organization conferred its inaugural Diversity and Inclusion Award to Hutchinson Sealing Systems in Newfields for its recruitment and training efforts aimed at creating a more diverse workforce&comma; Sharby says. 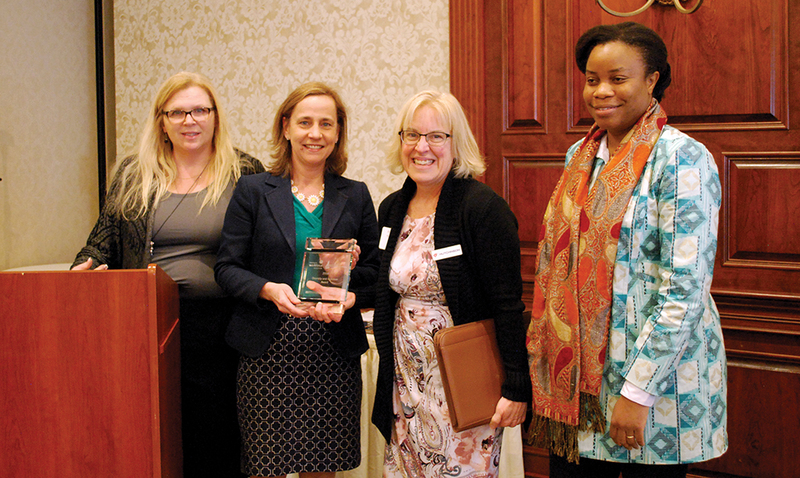 The Diversity Workforce Coalition’s (DWC) inaugural Diversity and Inclusion Award went to Hutchinson Sealing Systems. From left: Tina Sharby&comma; president of DWC; Manchester Mayor Joyce Craig; Shelley Lake&comma; HR manager at Hutchinson; and Nathalie Ahyi&comma; director of Health & Equity Partnership. Photo courtesy of the Diversity Workforce Coalition. Also in the past year&comma; DWC sponsored a Welcome Manchester event&comma; which promoted the integration of NH’s immigrant community. It is also planning a training on understanding hidden biases&comma; Sharby says. “I think there’s more heightened awareness of these issues&comma;” she says. This summer&comma; state officials and business leaders organized a forum to brainstorm ideas about how to make businesses in NH more diverse and more inclusive. The effort is a response to changing demographics in the nation and the state that have led to a workforce crunch in NH. “You’ve got to get young people willing to come into the state&comma;” says Rogers Johnson&comma; chairman of the Governor’s Advisory Council on Diversity and Inclusion. “How do I attract millennials or anybody under the age of 35? What are the things they are looking for? Diversity. The event&comma; organized by Will Arvelo&comma; director of the NH Division of Economic Development&comma; and Paula Parnagian&comma; manager of diversity and inclusion for Eversource&comma; attracted between 80 and 100 participants from a variety of sectors to brainstorm&comma; network and share ideas. Shortly after that&comma; media reports emerged that Anthony Schinella&comma; director of communications at the NH Department of Education&comma; suggested on his personal Facebook page that an effort to diversify for the sake of diversifying wouldn’t do anyone any good&comma; as no one wants the state to turn into a “cesspool&comma;” and that there was no way to guarantee only the “right” kinds of people would be coming into the state. Schinella told local news outlets his comments were not racially motivated&comma; but his comments were widely condemned&comma; including by both Commissioner of Education Frank Edelblut and the governor. Then there were the death threats. At least a half dozen participants in the forum received emails and calls from white supremacists threatening violence or worse if they continued their efforts. Arvelo additionally states that the need for this stems from NH’s demographic problem&comma; as the birthrate for NH’s overall population is declining and there are a number of “looming retirements across the board” that will place “significant pressure on our economy going forward&comma;” he says. Kenneth M. Johnson&comma; senior demographer at the University of NH’s Carsey School of Public Policy&comma; points to July 2017 census data&comma; the most recent available as of this writing&comma; to make this point. He says the new data suggests that the population of NH that is non-Hispanic white diminished by about 1&comma;800 between 2010 and 2017—a loss of 0.1 percent. As for the Hispanic population&comma; that is now 3.7 percent of the NH population&comma; a growth of 35 percent between 2010 and 2017&comma; Johnson says. Furthermore&comma; over the same time period&comma; the Asian population grew 29 percent to 2.7 percent of the NH population; the African-American population grew 26 percent to 1.3 percent; and the non-Hispanic two or more race population grew 20 percent to make up 1.5 percent. Johnson&comma; the demographer&comma; adds that there is no data to suggest this larger trend will be changing anytime soon. “We have no choice but to plan now for New Hampshire’s future in order to maintain our healthy&comma; diverse economy as well as New Hampshire’s place as one of the best places to live and work&comma;” Arvelo says. This will require a multipronged approach&comma; he says&comma; that includes working more closely with NH’s high schools&comma; colleges and universities to retain more young people in the state. Arvelo says NH needs to attract new people into the state. “Our efforts in the area of diversity are meant to make our state more welcoming to a host of different populations that include young workers and their families as well as people of different races and ethnicities&comma;” he says.